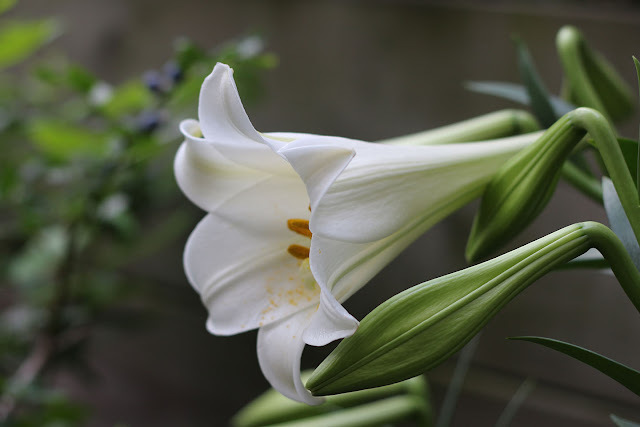 The Formosa lilies are opening. 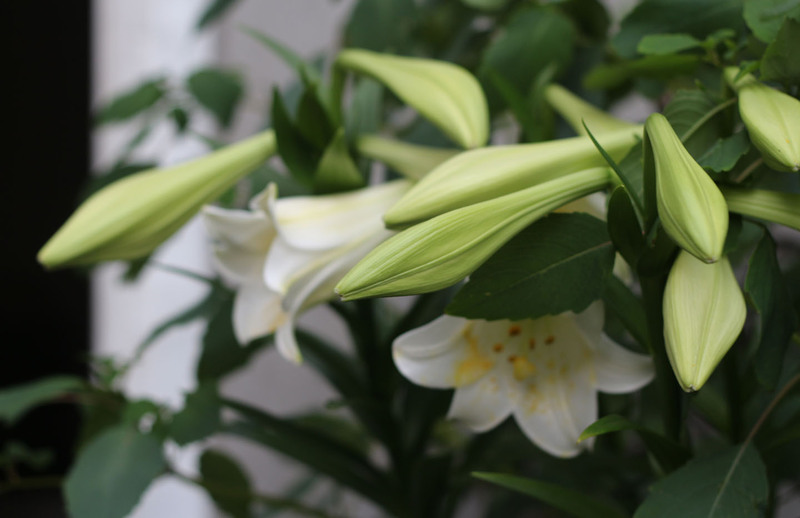 Lilium formosanum, named after the island to which they are native, now Taiwan, then Formosa. They are lilies in pure form. No spots and stripes, no flaring, no frills. Their scent is delicious and not cloying. 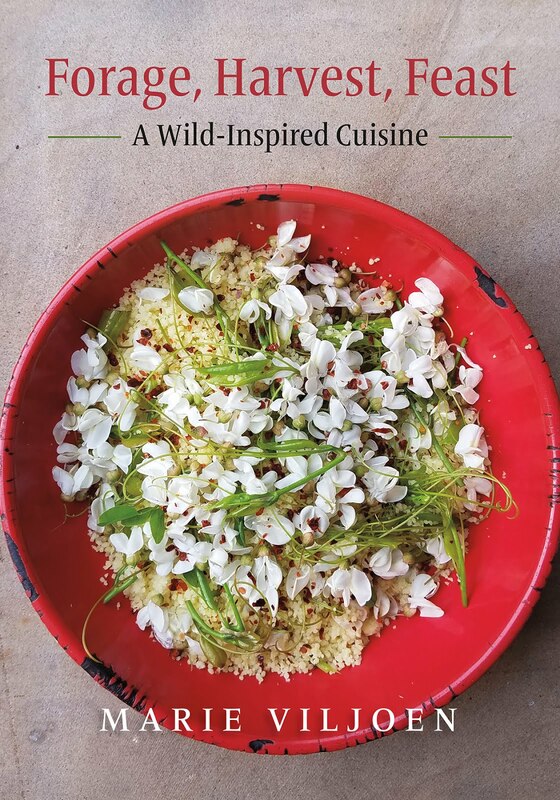 They have some competition from the jewelweed. Their scent is more pronounced at night. And good news! 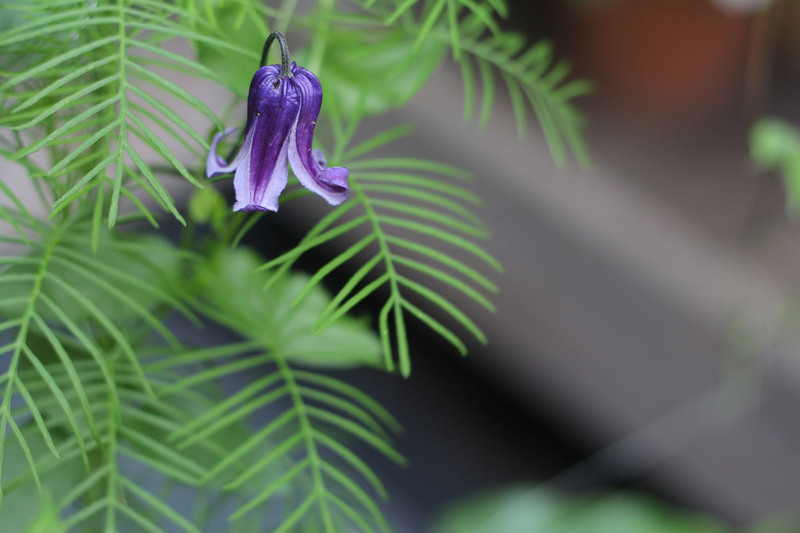 The 'Roguchi' clematis (below, with the leaves of a cardinal vine) is in bloom, a rare survivor of last winter. I was incensed the other morning when I found some perfect buds on the terrace floor, the stems neatly snipped. I blame the blue jays. There is four-bird family that visits the terrace - which is nice. But the teenagers are halfwits who will peck at anything that looks juicy. Perhaps they mistook it for a blueberry. I see that two Silk Road lily buds bear beak marks, too. It is July. The evenings are bringing rocket fire to the sidewalk, which last night had me diving for cover before I realized it was rocket fire. A little too reminiscent of the sidewalk gunshot two weeks ago. Apparently I've been away for the two previous 4th of July's so the local celebrations are new to me. We will probably spend that day out at Dead Horse Bay (I'm leading a walk there on August 15th, at low glass-gathering tide). It's been a while. And I have promised myself that I'd bake biscuits, and maybe make a ham. The local stoop sitters might like both. 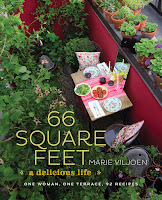 In other news, I will be giving a talk about local flavors and green spaces at Wave Hill on July 11th, at 1pm, and signing copies of 66 Square Feet- A Delicious Life. It would be nice to see you there. Thank you! I use Espoma Plant Tone about once a month. The potting soil is a mix of Espoma organic and miscellaneous others. 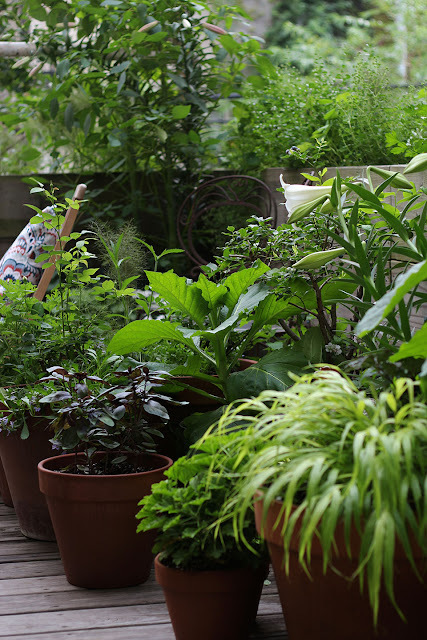 It should always be potting soil, though - topsoil is too heavy for pots. If there's a secret to plant health maybe it's that I look at the plants every day when I handwater. I pick off dead leaves, notice if there are pests, and so on. The regular presence of a gardener in a garden makes a big difference. Common problems tend to be over- or underwatering, too. 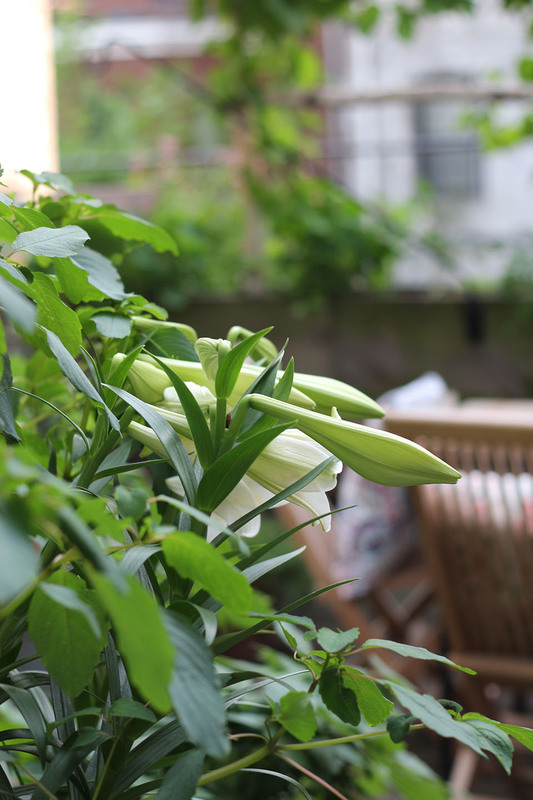 Your terrace is looking tropical, Marie! Gorgeous.